^ June 3, 1995 Montreal Expos at San Diego Padres Box Score and Play by Play - Baseball-Reference.com 2008年1月12日閲覧. ^ Washington Nationals Pitching Leaders - Baseball-Reference.com 2008年1月12日閲覧. ^ Baseball Awards Voting for 1997 - Baseball-Reference.com 2008年1月12日閲覧. ^ Baseball Awards Voting for 1998 - Baseball-Reference.com 2008年1月12日閲覧. 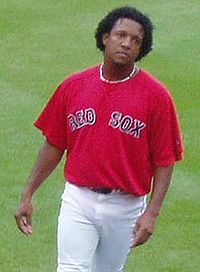 ^ Pedro Martinez 1999 Pitching Gamelogs - Baseball-Reference PI 2008年1月12日閲覧. ^ Baseball Awards Voting for 1999 - Baseball-Reference.com 2008年1月12日閲覧. ^ Baseball Awards Voting for 2000 - Baseball-Reference.com 2008年1月12日閲覧. 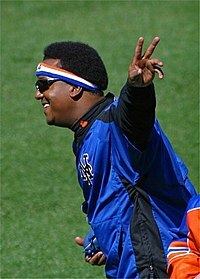 ^ Baseball Awards Voting for 2002 - Baseball-Reference.com 2008年1月12日閲覧.